This month our meeting is going to take on a unique feature. We are going to do three small break out sessions on three different topics. Each topic will go for about 20-30 minutes. Topics include iOS tips and tricks, Mac tips and tricks, OS X and iOS maintenance tips. For directions to our meetings, click here. We are now using join.me for remote meeting access. Pro members will receive advanced notice of access to the meeting. 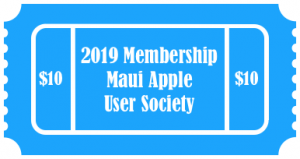 Regular members can receive the meeting ID code posted by 5:50 PM HST the night of the meeting both here and on our Facebook page. You can download the Mac App or search for join.me on the iOS App store.